Alexandre Dumas ‘ novel is perhaps one of the most adapted for the big screen, and the 2011 The Three Musketeers movie is closer to the source material than the 1993 film of the same name. Matthew Macfadyen (The Pillars of the Earth), Luke Evans (Immortals) and Ray Stevenson (Thor) play the Three Musketeers in the 2011 version, with Logan Lerman (Gamer) as hot-headed D’Artagnan. The three once-legendary French swashbucklers are now down on their luck but are called to reunite for a new mission. They must defeat Milady de Winter (Milla Jovovich, Stone), a beautiful double agent whose villainous employer has his eyes set on the French throne and pushing Europe into war. Orlando Bloom (Pirates of the Caribbean movies) also stars in the action adventure movie as the Duke of Buckingham, as well as Christoph Waltz (Carnage) as Richelieu and Juno Temple (Dirty Girl) as the Queen. The film was directed by Paul W.S. Anderson, whose action films include AVP: Alien vs. Predator, Death Race and two of Jovovich’s Resident Evil movies: Afterlife and Retribution. 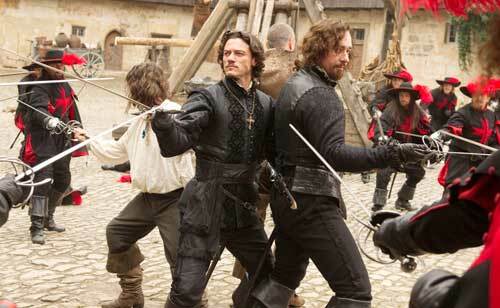 Rated PG-13, The Three Musketeers was a relative bomb in theaters, grossing only $20 million. The film got little love from audiences and less from critics. Says Orlando Sentinel critic Roger Moore: “This is a once-in-a-lifetime fiasco, an epic fail like none we have seen this year, a bad idea by a very bad director and a career-crippling credit for all concerned.” Major ouch! When it hit theaters, the movie was heavily marketed for its 3D, so its no surprise the film is available on Blu-ray 3D the same day as DVD and Blu-ray. commentary with director Anderson and others.